Your home is your castle; it’s where you spend the majority of your time, eat most of your meals, and sleep one-third of your life away. You already clean your home with nontoxic cleaners, so wouldn’t it make sense that you should also be doing something natural to clean the air you breathe, too? Houses are built with all sorts of toxic chemicals depending on when they are built, including formaldehyde, lead, benzene, and trichloroethylene – and something has got to clean the air to help eliminate those toxic pollutants from hanging around inside. 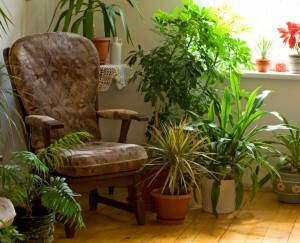 According to NASA, it is recommended that a 2,000 square foot house have at least 15-18 plants in them… which is a lot. I know I don’t have even half that many in mine! But the more plants you have (especially from the list below), the better the chances that they will do a good job of cleaning your indoor air. Since the air inside your home is usually of worse quality than the air outside your home (it’s true, look it up), it’s important we keep plants inside to filter the air and remove as many volatile organic compounds (VOC’s) as possible. They take in the toxins, absorb and filter them out, and release cleaner oxygen back into the home. It’s like having an energy-sucking air purifier running 24/7, with the right plants placed throughout the home. With all that in mind, here’s how you can use certain plants to clean the air without having to resort to fake products like Febreze and the like. Most of these plants are easy to care for and safe for pets (but be sure to check for your particular pet before bringing one home), even for the black-thumbed like myself. Formaldehyde comes from insulation, plywood, carpets, furniture, and some industrial cleaning agents. It is a gas at room temperature, is colorless, and has a terrible odor. Lead is used lead-acid batteries, solder, pewter, and many other metal products. It is incredibly poisonous and can damage the central nervous system. Benzene comes from cigarette, pipe, and cigar smoke, petroleum candles, synthetic fibers, plastic, and some detergents. It is a natural constituent of crude oil. Trichloroethylene enters the home via your dry cleaning, glues and adhesives, paint removers, lacquers and varnishes, and industrial solvents. It is a clear non-flammable liquid with a sweet smell. Whether it’s the paint on the walls, the carpets on the floors, the furniture in your living room, or the pipes in the bathroom, there are all sorts of toxic items in your home that are possibly emitting pollutants. Utilizing some of these plants will mitigate at least some of the risk we face while living in our homes. Be sure to follow the sunlight/watering needs carefully so your plants will last a long time and do what they are best at doing – cleaning our air! The lists are so helpful! I’ll be doing this for sure! My last real plant just died. When I go out of town, my subletters and roommates are terrible about watering. I wonder how many I need in my NYC apt. This is a very thorough list and a great post to share with others! In offices, I use the term sick building syndrome, so having some plants in your office or cubicle is a good idea as well. You can also ask what your company is doing to improve indoor air quality.